Ceramics designer Jacqueline Harberink took part in the exhibition Enlightened Design III during the London Design Festival 2018 in the Olympia Room together with Marc de Groot, Alex Groot Jebbink, Jesse Visser, and Margaret van Bekkum. The titillating [non-]transparent chandelier is a ‘light’ protest against these times in which we talk about our pursuit of transparency, says ceramist and artist Jacqueline Harberink. People must not be online constantly; it is okay for people to be unreachable and have secrets if they want. After all, everyone needs privacy and peace in today’s information overload. For example, the original porcelain chandelier symbolises, literally and figuratively, the threat that is hanging over us when it comes to lack of privacy. 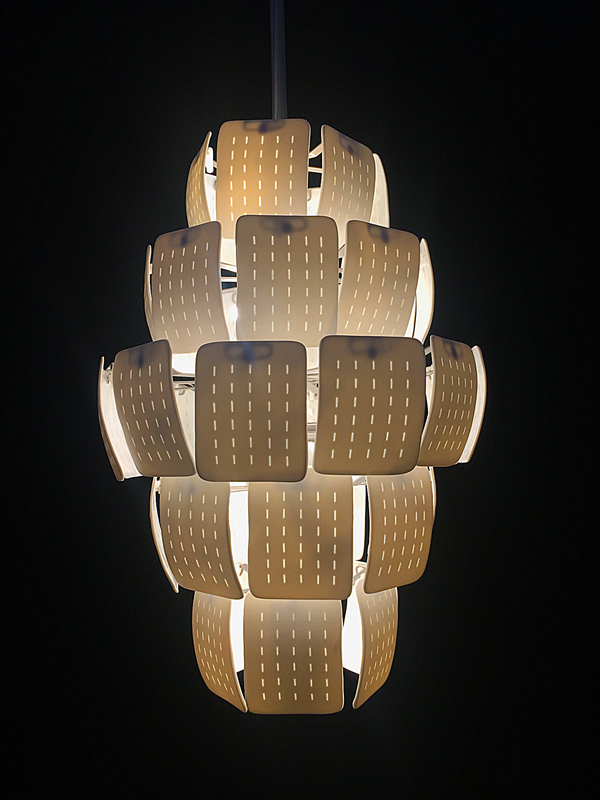 The modular [non-]transparent chandelier of about 120 by 50 centimetres consists of several floating porcelain layers that were hand-made according to the labour-intensive, forgotten Chinese ‘rice grain’ technique from the fourteenth century. The ceramic maker has made the thin porcelain ‘leaves’ transparent by making holes in it. She then closes them invisibly with transparent glaze on the inside to protect our vulnerable privacy. ‘Our privacy is just like porcelain: beautiful, special, and powerful. But you have to deal with it in the right way, otherwise it is very vulnerable’, she says. The special chandelier not only offers a strong social statement, it also makes us think and is, at the same time, a refined, aesthetic, and quirky beauty that we like to hang above our heads as we are being enlightened by this elegant chandelier.